Bill had been driving all over the Adirondacks since early Friday morning. I was in my car heading north to meet him. I’d get occasional calls from him about the wintry conditions and iced-over lakes that he found. Ice-out was late this year, so our original plan to canoe into the St. Regis Wilderness Area for a few days of fishing was scrapped. Instead, we decided on fish Rock Pond, in the Pharaoh Lakes Wilderness. Bill had been wanting to fish the pond for years, and he was sure we had a chance for some big brook trout. From the DEC boat launch in the campground on Putnam Pond we paddled about two miles to the carry at the other end of the lake, about three quarters of a mile from Rock Pond. In the canoe, we had a good amount of stuff — more than we needed for three days. We hiked up to Rock Pond carrying the heavy packs first and then returned for the canoe, paddles, and a lighter pack. It had been raining all morning, but it was clearing as we left Putnam Pond and the weather was pleasant. As we arrived at the shallow cove on the far end of Rock Pond, I noticed a few ice patches in some of the shady spots. We were pleased to find the Rock Pond Lean-to unoccupied, since it was the only real shelter on the lake. These rustic, three-sided log shelters are much appreciated when the fickle Adirondack weather changes for the worst. This one looked like it was in pretty good shape, including a newer roof. We took some time to get our stuff situated, eat some food, and then fish in the early evening. I noticed we didn’t have cell service, so I set my phone to airplane mode and put it in the front pocket of my backpack. I had already let my wife know where we were camping and that there might not be service in the area. Our gear was strewn all over the floor of the lean-to, and we were sorting through our fishing gear when four hikers approached from the opposite direction we had come. Three of them stayed on the main trail, but one came to talk to us. She was a confident hiker that looked like she might be in her late 50s or early 60s. She told us they would “let us have the lean-to” and camp at the primitive campsite down the trail. She said they might return to the lean-to if the storm coming she expected in the evening was bad. They were on a short backpacking trip, hiking in from one of the many trails in the wilderness area. They left, and I saw them as they passed by the back of the lean-to, picking their way down the trail on their way to the next campsite along the lake. We had had a good day of fishing. I used my southern New England bass fishing tactics and caught several brook trout on a black rubber grub, casting toward the submerged limbs and branches along the shore. Bill used his Adirondack brook trout fishing tactics and caught a similar number of trout on a “Lake Clear Wobbler” and a worm. We kept a couple trout for dinner, or maybe breakfast. We were tired in the evening. It was a long day of traveling, paddling, hiking, and fishing, so we saved the trout for breakfast. We had plenty of food with us anyway, so we ate mac and cheese with sausage, built a nice fire in the pit in front of the lean-to, and drank some of the beers we brought. I brought a few beers from Connecticut, and Bill brought some from Vermont. The sun was getting lower in the sky when the wind started to pick up. It was annoying, blowing smoke and embers at us. We prepared the campsite for the night, stowing our gear in the lean-to, out of the wind. It looked and felt like rain was coming. I walked up the hill and looked for a tree to hang the bear rope on. I picked a tree about 20 or 30 yards from the privy on top of the hill, figuring that we could follow the trail to the privy, then veer off to the left near a large rock and tree. I took a good mental note of the landmarks, knowing that it would be dark when we returned to hang the food for the night. We got out our headlamps and lights for the lean-to. I set up my solar lantern — a lightweight, inflatable plastic cylinder that looks plain and simple but is surprisingly useful. Bill’s headlamp wasn’t working right, and was using a little pocket lantern, or borrowing my headlamp. Around 7:45-8 pm, the winds really picked up. It was getting dark, but there was still plenty of ambient light. I sat on the edge of the lean-to and watched the taller pines as they swayed in the wind. It was somewhat comforting that there weren’t any large trees in front of the lean-to, which faced the rocky hillside. There were some large trees between the back of the shelter and the pond, but they looked healthy and sturdy. We had a lot of pine trees on our property where I grew up in Connecticut, and I remember some of them breaking unpredictably during storms. It always made me nervous to camp in a pine forest, but, since Rock Pond is surrounded by pine forest, this lean-to was probably the best place to be in the area. Carvings in the logs that dated back to the early 1970s reassured me a bit. This shelter has seen some weather. A heavy rainstorm blew through, extinguishing our fire. We had built up the fire, hoping it would be hot enough to withstand the rain, but the rain was too heavy. Bill managed to restart it afterward, and the wet smoke filled the lean-to. One of the tall pines on the hill fell over during a big gust. By this time, it was almost dark, and I could see the shadow of it as it fell up the slope of the hill. Later, when we hung our food from the bear rope, we discovered that the tree had fallen on the privy. It was difficult to find the bear rope after the tree had fallen — the trail looked much different. The wind was a lot stronger on the hillside than it was near the lean-to, and we quickly made our way back to the shelter after hanging the food. Why was the weather always bad when we camped together? A bit nervously, we joked around about it as we picked our way back down the hill. It was around 10 pm. The darkness of the Adirondack wilderness made it so you couldn’t see what the pine trees were doing anymore. It was still windy — just as we thought it might die down a bit, a big gust would come though, snapping some pine tree off in the distance. I tried to guess what the sounds meant. A broken limb would make a higher pitched snap. An uprooted tree wouldn’t snap — just a dull thud when it hit the ground. A larger tree that cracked somewhere above the stump would make a deeper cracking sound, followed by a thud when it hit the wet ground. I wondered which way to run if we heard a snap from behind the shelter, and, after some thought, I decided that it would be better to stay in the shelter. It was quite a storm. The last forecast I looked at called for 30-something mph gusts. This felt much worse than the forecast. We talked about the group of four hikers that we saw earlier. They must have decided to hike out after all, since they didn’t return to the lean-to in the storm. We hoped they hiked out — it was a bad storm, and the campsite that they were heading to when they left us was surrounded by large pine trees. We concluded we were the only ones crazy enough to be out here in this weather. We turned off the lanterns around 11 pm, and got into our sleeping bags. I knew I wouldn’t sleep much — I never do on my first night in an unfamiliar place, and this storm made me nervous. In my younger days, I might have just drunk enough beer until I didn’t care about the wind anymore. Nowadays, I prefer to stay alert, sober, and fully functional during questionable situations. I’m glad I did. Those four hikers were still out here. I climbed out of my bag, sat on the edge of the lean-to, and laced up my hiking boots. I grabbed my rain jacket and headlamp and followed the woman down the trail. “I’m surprised that I could find you guys.” She seemed fairly calm. I thought it must be a small tree, and they just need our help to lift it off. Our lights reflected off the wet rocks and bushes as we made our way to their campsite. It was a mess of tree limbs and sticks. In the darkness, it was hard to tell that it was a campsite at all. We came up from behind the tree, and I had to peer over it to see her. It was the lady that we talked to, the leader of the group. There was no way we were going to budge this tree; it was huge. We tried anyway. We needed to get to a place that had cell service. We had to make some sort of plan. 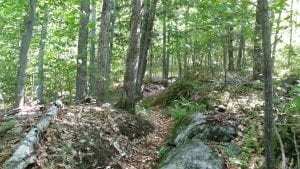 We could hike a little over 1.5 miles overland to Putnam Pond State Campground, but following the trail would leave us far from our vehicle, and the campground was empty this time of year. We decided to take the canoe, returned to our lean-to and grabbed my phone, car keys, and extra headlamp batteries. Bill put the canoe over his shoulders and I grabbed the paddles. He used my headlamp and I took the inflatable solar lamp and walked in front. As we passed their campsite we saw the lights from their headlamps bouncing off the trees. We yelled over that we were going for help. It was only three-quarters of a mile to the put-in, but the trail looked so much different at night. Near the top of the first hill Bill set the stern of the canoe down, and held it up while I climbed under, resting the yoke on my shoulders. The trail was a muddy mess. I slipped and fell a few times. I saw a little drainage channel made of rocks that I didn’t remember seeing on the hike in. I had a feeling that we were walking the wrong way, but we didn’t see any other trails, so we kept going. The trail opened to a wider triangular shape, and our light stopped reflecting off the trees. We had found Putnam Pond. Bill’s kevlar canoe is great for backcountry trips. It’s large enough to hold a lot of gear, but weighs about 40 pounds. But in a storm with gusts that felt like 30 to 40 mph, the light weight worked against us. It acted like a sail, and wanted to turn broadside to the wind. It was cloudy with no moon or stars to light our way. I was in the bow with the headlamp and we could only see the outline of the shore, when you we were very close to it. We paddled hard, broadside to the wind for a while — fighting to keep the canoe from blowing ashore as we rounded the a point, we aimed back into the waves and made for the opposite shore with the wind behind us. When we reached the boat launch Bill pulled the canoe ashore while I ran to the parking area to get my car. I felt relieved that the hard part was over for us — we just had to make a call. It was just before midnight when I started my car. I picked up Bill and drove as fast as I could through the campground, slowing often to maneuver around fallen sticks and limbs. Our plan was to head towards Ticonderoga and drive until we either got cellphone service or saw a house with a light on. It wasn’t far from the campground gate when we saw a house with the lights on inside. It was 12:03 am. Bill knocked on the door and a woman answered, invited us in, dialed 911, and handed me the phone. She grabbed the remote, shut off the television, and listened to Bill tell her the story as I waited for the 911 dispatcher. The dispatcher asked me for a street address and I told it was a backcountry accident at Rock Pond. We went back and forth. “Putts Pond?” “No, Putnam Pond.” “Putts Pond Rd?” “No, the lady is out in the woods, you have to take a boat or hike to get to her.” “But it’s Putts Pond Rd?” Eventually the dispatcher said she would send crews to the boat launch at Putnam Pond. We drove to the intersection of the main road to flag down the rescue crew. We met them shortly, and drove to the boat launch. Pickup trucks and emergency vehicles soon cluttered the launch. One truck had an old boat with no outboard. Flashing lights, diesel fumes, and engine noise replaced the noise of the wind and the waves. We talked with a police officer and some firefighters, and offered to use our canoe to take a young firefighter and his chainsaw to Rock Pond. We saw a paramedic come and quickly leave the area, and later learn that she and a firefighter were hiking in on the trail from the campground. We load the canoe with the firefighter. He tries to sit on one of the thwarts, and we tell him to sit on the bottom to make the boat more stable. He kneels in the water that collected in the canoe. We begin crossing the pond, and are close to the point when we hear a voice on his radio. They want him to come back — they have a boat on the way from Ticonderoga, and they want us to ride out on the boat. It’s about 12:45 when we returned to shore, and I’m sitting on a dock that hasn’t yet been put in the lake for the summer season. Bill is talking to the police officer and the fire chief, trying to explain the need to move all the vehicles from the boat launch for the boat that’s on its way. He eventually succeeds, and the trucks and ambulances are moved — but not far enough — and they needed to be moved further once the boat arrives. The boat is launched. It’s a 23-footer powered by a 115-hp outboard motor. It has a top speed of about 45 mph. It has an open deck similar to a pontoon boat, and an overhead bar with flood lights mounted to it. After some difficulty with the trailer, the firefighters launch the boat, spin it parallel to the dock, and we hop in and wait. What are we waiting for? “Chainsaws.” I jump off the boat and run up to a man fixing a chainsaw. He points to a young firefighter behind me who jogs up to me, smiling, and hands me two chainsaws. I jump on board – “All right, let’s go!” No, not yet, we’re waiting for some other guy. Bill and I sit together in the seat across from the operator and stare at the ground as we wait for something to happen. It was taking too long. Maybe we feel different about it because we saw her out there, but these guys just weren’t moving fast enough. After what seemed like an eternity, we’re finally ready to go. With a crowd of people and equipment on board, the propeller is stuck in the mud. The operator fumbles with the controls of the boat. He finally finds the trim control, raises the motor, and frees us from the mud. “Be patient guys, it’s going to be a long, slow ride. I don’t know this lake,” he says as we putter away from the dock, as the wind and waves buffet the boat. Bill and I look at each other. We’re not just going slow, we’re not even going fast enough to keep the boat straight. The deck lights light up the inside of the boat, making it impossible to see anything past the bow. I asked the operator to turn the lights off, but I’m ignored. It seemed like everyone on the boat was giving directions to the operator, but they were all different, and they always started or ended with things like “when I was hunting out here, we went over there’’ or “I haven’t been out here in years.” I felt my heart rate increasing. I knew I could get this boat there. Bill could get it there, too. People were fumbling with some spotlights, one of which wasn’t working at all. One would flash on and off constantly. After about 15-20 minutes of wallowing around — not even out of earshot of the vehicles at the boat launch — they decided that they couldn’t make it any further. The reasons were numerous — It was too windy, those other people are hiking there, that “they tried, they gave it their best shot.” I couldn’t take it anymore. “You didn’t try at all.” Some guy up front barked back at me “You’re not in charge of this operation.” And that was it. They turned the boat around, after traveling about half as far as we did when we tried to take the firefighter out with us in our canoe. I couldn’t get off that boat quick enough. As some of the firefighters were trying to get their boat back on its trailer, Bill and I took our canoe and brought it to his truck in the lot on the hill. “Hey, where are you guys going?” We turned around and saw a firefighter chasing us up the hill. Bill told him that he was getting his canoe out of the way. “My chief wanted to know where you guys were going. He didn’t want you to try to go back in there on your own.” I thought about how much sense that made — that we would carry our canoe away from the boat launch and up the hill into the woods to launch it into the pond. By this time, I was sure that our biggest mistake had been calling 911. I think we would have been better off paddling to the launch, driving to the 24-hour Walmart in Ticonderoga, buying a couple cheap chainsaws and shovels, and paddling back out there ourselves. We put the canoe on Bill’s truck and stood in the dark parking lot, thinking about the woman still trapped under that tree while we were here, standing around, while people talked on radios and chatted with each other and went on boat rides and fixed chainsaws and drove their UTVs all over the campground. I thought about the sense of relief I had felt when we got to a phone and the naive thought that the people we called would be able to help us. I thought of the responsibility that we had taken to go find help. There were four people out in the woods waiting for us, and here we were leaning on a truck in the parking lot. Some wonderful job we did. I felt awful. Around 2:45 am, we heard the sound of one of the UTVs coming into the parking lot. Two men were in it. “The chief wants to speak with you.” We’ve given them detailed directions a few times already. What now? What else could they want? We climbed back into my car and followed the UTV through the campground to another trailhead. This must be the trail that the paramedic hiked in on. They started that hike hours ago when we were still waiting for the boat. Where did they go? It’s only a mile and a half from the trailhead. The chief was sitting in his pickup truck with another firefighter, listening to his two-way radio. He complained about the radios, telling us that the department spent a fortune on them and they didn’t even work right. Were the rescuers there yet? No, they were lost. It sounded like there were multiple groups of rescuers wandering aimlessly in the woods. One group contacted the chief — they hiked to the wrong pond. The chief wanted to know if we had a map — they needed to know where Rock Pond was. We told him that the map and GPS that Bill brought was in the lean-to. I handed my phone to Bill and he used the crude map on google to show the chief where the rescue party took a wrong turn and hiked to a different pond. We stayed at the chief’s truck long enough to hear that a rescue party had reached the woman. It was well after 3 am. Finally, after more than three hours of trying, the fire department had found them. We excused ourselves and returned to the parking lot where Bill’s truck was parked. We were in the parking lot discussing what to do next when two New York Forest Ranger trucks pull up and park. They had just launched their boat, and were getting ready to help with the rescue. Bill explains where the campsite is located, and they tell us that they know which one it is. They even knew that there were a lot of large pine trees around the site. They finished preparing their gear, thanked us for the help, and walked down the hill to the boat launch. It was almost first light, and these were the first people other than us that had any idea where the victim was. Why did it take so long for them to get here? Bill and I guessed that maybe the firefighters hadn’t bothered to call them until hours after the rescue operation started. Bill wanted to let his family know that he was in good health. They live in an area that gets news updates from Ticonderoga, so he didn’t want his family to think he was the one that was injured. We drove into Ticonderoga and sent a couple emails. It was about 4:15. There was an airport near the gas station, and a helicopter was running, preparing to take off. It flew away as we were discussing what to do next. There was no point in trying to sleep. We grabbed some breakfast from a gas station and headed back to Putnam Pond. It was a cool gray morning. It was still windy, but much calmer than the night before. We carried our canoe back down the hill past the Ticonderoga and Chilson Fire Department trucks idling at the boat launch. There was a medevac helicopter perched on the edge of the stone wall, its tail boom hanging out over the water. The pilot said he just got there, that he couldn’t fly from Burlington because there were 50-mph winds last night. He wished us luck and told us not to drown as we paddled away. We rounded the point, headed toward the island, then rounded the island and followed the shore to the canoe carry trail. We could see the rangers’ green flat-bottom boat at the carry. We slowed down and waited — we were far enough away that we couldn’t see much. A crowd of people carried an orange litter onto the boat and the boat slowly made its way back to the launch. It was after 5 am. Once the trail entrance was clear, we brought our canoe to the trail. There were a couple tired-looking young firefighters there and a ranger. They told us that she was in rough shape, that she looked OK when they first got there, but her condition worsened as they came down the hill. The rest of her party passed us on the way up the trail. Two of them thanked us, one of them after giving Bill his saw back. One of them didn’t recognize us and told us “that lady would have loved to see you and your boat last night.” The firefighters that passed us didn’t make eye contact as they walked by. It felt strange to be back at the lean-to. I don’t think either of us wanted to be there, but Bill was too exhausted to pack up and leave, and I wasn’t sure about anything. Maybe I was just tired, too. I slept for a few hours. The sun was out when I got up, and the lake was calm. It was a nice spring day — chilly in the shade, but warm and comfortable in the sun. I didn’t enjoy it at all. The last place I wanted to be was here, at this beautiful lake on a sunny day with loons calling to each other and spring peepers singing. I went for a walk and saw three or four trees that had fallen the night before. I fished for a while. Bill got up and we combed through the details of the night before. It was all we could think about. 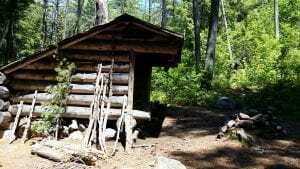 Why didn’t the hikers come to the lean-to? Why were the firefighters so inept? Why did it take so long for the rangers to get there? What did we do wrong? Why didn’t we have the rangers phone number and why didn’t we call them instead of 911? Why did we both feel so bad about the whole thing? We thought of everything, and it consumed us for the rest of the day. A couple guys set up camp where the tree had fell the night before. They had no idea what happened there a few hours earlier. When I got home, I still couldn’t get the trip out of my thoughts. We found a few vague articles about the rescue, and eventually found one that identified and described the woman as Lynn Malerba. She was an experienced and licensed Adirondack Guide. She must have been taking the other three hikers on a guided trip. She taught map reading and navigation courses. Over the next few weeks Bill and I kept talking about what happened. We want to make something positive out of this experience. I’m not sure how, but maybe sharing our story will help. At the least, maybe it will educate hikers to prepare for the worst and to think about who you call for help in the wilderness. It makes a big difference. I wish this story had a happy ending. Lynn Malerba died from her injuries on May 7, 2018 at the age of 60. I only talked to her for a matter of minutes, but I doubt I’ll ever forget her name. 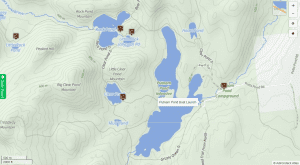 Photos of Rock Pond, the Rock Pond Lean-to, and the hiking trail near Rock Pond in the Pharaoh Lake Wilderness by John Warren; Map courtesy Adirondack Atlas. Joe Wagner is a Connecticut-based writer who likes to share his stories and his unsolicited opinions on public policy at www.overthereef.com. Thank you Joe for an excellent account of this horrific tragedy. Our hearts go out to Lynn’s family and friends, as well as you and all of the responders as I doubt anyone involved will ever forget it. I just want to say that you absolutely did the right thing. Unfortunately, that sometimes is not enough. You should not second-guess yourself – you are the only reason she received aid at all. Even with the promptest care, it is possible the outcome would have been the same. Often with these types of accidents, the victim stays fairly stable – but once the weight of the object is removed, the victim’s vital signs go rapidly downhill as internal injuries manifest themselves. Perhaps a quicker response would have minimized suffering, but who is to say? This was an unfortunate, ghastly, and random act of Nature that no one will soon forget. Again, my condolences to all. Thank you Joe for your touching account. Boreas is so right. Joe, you clearly did your best and by writing this very moving, in fact disturbing, story you have made Lynn’s tragedy into an object lesson which might save someone else from a similar tragedy. Because we don’t have enough Forest Rangers. Yellowstone is 2.2 million acres in size and 330 permanent rangers are employed there. In the Adirondacks, the State’s 6 million acre park, there are just 50. 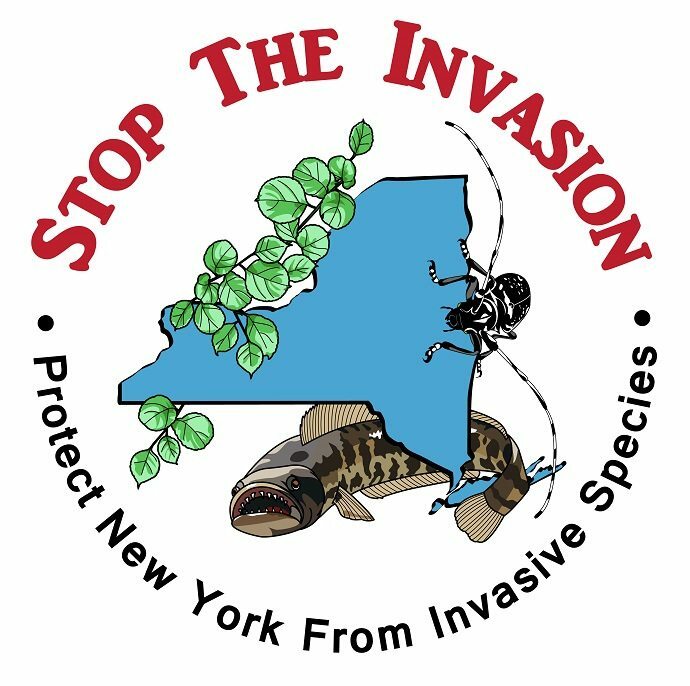 Rule #1 – Call DEC Ranger Dispatch in Ray Brook FIRST 518-891-0325. Local rescue/fire is well-meaning and expert on the road, but they can only assist in backcountry rescue. How tragic – I wish everyone had just shared the lean-to! Correct number for NYS DEC Ray Brook dispatch is 518 891 0235, not 0325. Or call 518 897 1300 for same DEC dispatch. Thanks Scott…. all of us who live up here, and work outdoors, should have these numbers in their smart phone. You never know…. Wow – so sorry – that is the right number, I transposed it. 518-891-0235 is correct! The author is to be commended for his willingness to go above and beyond to assist a stranger in particularly difficult circumstances, and his first-person account is well-told. However, the trauma and frustration surrounding the events of that evening may have blinded his reasoning: That same willingness to help a stranger in need is exactly what those firefighters, rangers, EMT’s, and other first responders were exhibiting. The author is quick to question the motivation, skills, and organization of these folks, and slow to think beyond the nose on his own face- his narrowly focused assessment shows little awareness of how a complicated, difficult, multi-agency rescue effort is undertaken. There are no “lessons” offered by the author, only a slanderous hit-job on local responders. Mr. Wagner’s byline brags of offering unsolicited opinions. Indeed, he is most welcome to keep them to himself. I find the Adirondack Almanac not without fault here either. Is there no reporting to be accomplished here? No facts to check? No opportunity for “the chief” to respond to the claims leveled against him? Local first responders would be right have significant frustrations with this commentary, and this publication. What do you believe is factually wrong to the point of “slander”? What do you dispute about the timeline or personnel involved? It seems like a pretty clear story. Any first responder will tell you that this type of debrief is essential to learning and improving our ability to save lives. They are mandated in every cases I have been involved in, and are considered invaluable by all parties. I did not question any of the “facts” in the article, such as they are, since the piece is a commentary and not a news report. The author was present, and I was not. Ineptitude, however, is in the eye of the beholder and is a serious claim to level without having, or providing, a full picture of all the details. This appears to anything but a clear story. I would not consider this article to have any relationship whatsoever to a formal first responders debrief. This is very much the standard step in the debrief, with timelines and events pretty clearly laid out by non-professionals. Not being able to launch a rescue boat, ATV’s that were not necessary, chainsaws that didn’t work, multiple steps to perform simple tasks. If you accept the facts, then those are inept actions. Any first responder worth their salt would welcome this report. A person died, and it doesn’t get more important to get perspectives than that! We all make mistakes and operations don’t go as planned. However, this tale of woe is a truly catastrophic and should clearly be a wake-up call to the local first responders: they were not able to respond. DEC begs people to call them, NOT 911, for backcountry emergencies. I never knew exactly why, but now I do. I just checked my phone to make sure the number was still there – yes, 518 891 0235. Thanks – I never knew that. Probably because carrying a phone when I used to hike would be akin to carrying a TV. But this is a serious issue as Joe has clearly demonstrated. It seems like any call from the backcountry to 911 should immediately trigger a transfer or patch- in to DEC @ Ray Brook dispatch. I suppose part of the problem in this case was that the call was made from a land line at a domicile far from the remote scene. Certainly a tragic example of inadequacies in the 911 system. This is an important post. I’ll be going into the 5 Ponds region in about six weeks, and I would like to have permission to reprint this article so I can laminate it and leave it at registers and shelters. 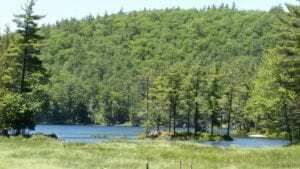 I have been canoeing, backpacking and bushwhacking these woods since the 70’s. I’ve heard many branches and trees come crashing down on perfectly still days. A few years ago I saw a tree come down during a wind storm, maybe a football field or so away. It was on the ground in a flash, even before I heard the crack of its breaking. I often thought I might find myself in Lynn Malerba’s situation, and accepted that fact. After reading Joe’s article, I am not so sure. I concur with Curt Austin also. That number is in my phone now. By the way, the only cell service I can find in the Star Lake area is from near the Newton Falls Hotel. In the woods I take the battery out of my flip-phone. Sharing this story is a good thing. Wow ….911 should be able to assess if DEC is to be called —-911 is etched in our minds – the DEC emergency number is not. You would also think a local Fire Company stationed in the Adirondacks would know to call DEC when the situation calls for it. Great, interesting write up – really makes you think. As a family member I can’t tell you how painful it is to read this. Please, I am asking that this article be removed before more of the family sees it. We are all still deeply greving and to read about Lynn suffering, in print is sickening. Again PLEASE remove this article. The “we’re in charge” attitude that Ticonderoga firefighters displayed is exactly what I’ve seen from them for years: an unwillingness to listen to or take input from anyone outside the fire service. Now someone died. Also, since it was a backcountry rescue, Essex County 911 should have called NYS Forest Rangers first. Don’t they have a protocol? An excellent point. The critical piece of the timeline is when was the DEC actually notified? Regardless, with more backcountry to patrol and protect, we simply need more rangers. Listening Governor? An early article in May in the AE states DEC was notified at 1am and Lynn was located at 2:30 am. I would love to hear the OTHER side of this story. Unfortunately, you won’t hear the OTHER side of the story – lawyers would nix the idea of putting ANYTHING in print. This is an amazing story, all around. One would hope that the local first responders would contact DEC rangers who know the woods like the back of their hands. These local first responders’ incompetence was a likely contributing factor to poor Lynn Malerba’s death. How sad they would not listen to you and Bill. We really have two different timelines here – one by the author and one by the officials. As others have said, the author’s point of view was as an involved participant and not an objective observer. He was frustrated at what was seemingly a slow response, but not necessarily incompetent response. Keep in mind, typically first responders arrive at a scene from different directions and follow commands on the scene by someone in charge. An issue here is that I do not believe first responders have much training in back- country rescues. I would assume that responsibility would fall to rangers. It is very likely the volunteers were called back to the dock after the rangers were called and on route. Their superiors are responsible for their safety and sending an untrained crew onto a lake in rough weather is very hazardous. It is hazardous for rangers as well, but they typically will have more experience and training. So I wouldn’t be too quick to impugn any of the responders as being inept. They were called to respond and did so, but backcountry medical rescue may not be one of their skill sets. They were likely as frustrated as the author. Regardless, I seriously doubt it would have made a difference even with immediate care. After all, she fought for several days in the hospital only to die from her injuries – not from lack of care. I had a feeling when I started reading this that it was about Lynn. How sad that time was likely the reason she did not make it. Having done some search and rescue myself, I know that a lot goes into planning a rescue, and it often isn’t speedy. But from the other side of the equation, the thoughtful preparations can look like “no one is doing anything!” It is horrible the rangers weren’t called sooner, and that the fire department, which is probably made up of volunteers (like the one I worked with), did not have enough training to handle this situation better. Hopefully lessons were learned by all from this tragedy so that when a similar situation arises in the future, everyone is better prepared. There are details that have been omitted that make sense once they are included in this story. Trip planning details, choice of camp selection and medical details. This was not a routine night rescue. This was a rescue due to a weather event. To my mind, the biggest opportunity for improvement here is the 911 system. If, in this area, the DEC is ultimately the responsible organization for backcountry response, it would seem 911 should be able to patch a 911 caller through to Ray Brook dispatch immediately. But where confusion can occur is what is considered ‘backcountry’. A 911 operator is trying, as quickly as possible, to get an address or location for any incident. When a caller is calling from one location to report an emergency in another location with no real ‘address’, time is lost explaining the situation and more potential for confusion develops. Perhaps, in areas where DEC responsibility exists, a 911 operator question early in the conversation directly asking if the incident is happening in the backcountry could prompt an automatic phone transfer to Ray Brook dispatch. Ideally, 911 should still stay connected during the triage by DEC, and both groups should work in tandem to facilitate the proper response. Be it good or bad, 911 is ingrained in our minds now, and calling 911 instead of DEC will certainly happen again. Hopefully this tragedy will shed some light on current inadequacies in the emergency response system and help to streamline future backcountry emergency response when 911 is called instead of DEC dispatch. First off, a sincere Thank You to the author for bringing this incident into the light for all others to hopefully learn a valuable lesson from. I’ve been involved with Fire Depts for many years and I’ve always been bothered by the inept nature of the way things happen. The ridiculous grandstanding and insistence on maintaining “operational command” over just getting the job done is truly absurd. Hours going by and nobody even has a proper map or GPS? There’s just no excuse. Calling back a boat that is halfway there so somebody can claim testosterone rights is just criminal. I think a large part of the problem is the same as the current problems with the police, the companies that spring up to provide “training & certification”, at considerable profits of course, just tend to create megalomaniacs that are incapable of independent thought instead. These for profit companies just “develop programs” to market and sell to big brother and make it so you can’t even be involved in that field without their contrived qualifications. Most of the people I’ve seen in these fields the past 20 years are just certification & credential junkies who get into it for the “look at me” factor & fall on their faces the first time a real situation is put in front of them. I walked away from it for exactly that reason. I’ll also add that the damage from Pine Bark Beetles among others are making the trees a lot less safe. You bring up some great points and obviously have more experience with the inner workings of a fire department than most others do. Maybe you could explain a little further how a fire department obtains the funds to purchase a boat that is probably over $50,000 and then not have the training to be able to use it for search and rescue operations? How is it possible that a canoe made it farther than a boat with a 115 HP motor? I just don’t understand it. This story is just a tragedy all around and my deepest condolences go out to Lynn’s family and the the members of the hiking party that experienced this horrific event. Secondly, it seems inconceivable that an emergency response team in such an area, particularly made up of hunters and fishermen, should be so unprepared for off-road incidents. The first rule in an emergency involving injury is to get *somebody* – preferably an EMT – to the scene of the accident as quickly as possible. In this case, as no doubt in many others, that’s clearly an off-road motorcycle. 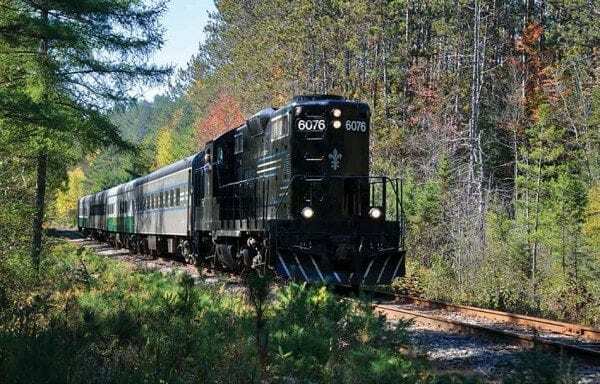 The ADK trail map lists all the trails and trail intersections, with mileage, and the author could have pinpointed the campsite on the map. A motorcycle has a headlight and an odometer, making it a far better option than hiking in in the dark, unless you already know the trails intimately – and even then, it will be a good deal faster. It couldn’t have been much more than 2 miles from the woods road which connects to the boat launch (I can’t find any route that’s only 1-1/2 miles); it shouldn’t have taken more than 15-20 minutes to reach the site. An EMT as a passenger, with a medical kit and chainsaw, provides someone to log trail intersections, check the map locations, and help push if you need to negotiate a section manually. And although I don’t have that ADK trail guide, it would have probably provided the trail details in a 3-minute read. The biker can also drop markers to go along with the bike’s tracks to keep follow-on hiking personnel from going astray. Third is the fancy rescue boat, with lights that don’t work, an operator who can’t drive it, and a crew which won’t take navigation instructions from two men who just canoed the route twice within 24 hours – once in the dark. ‘Nuff said. Lastly, a note to the author. When I camp, I carry a “camp ax” (a real axe with a 24″ handle, filed with flat cheeks to make it an effective felling axe), a trenching shovel, and a folding saw capable of cutting 6″ timber (or 12″ if you work your way around). With those tools, it might have been possible to dig her out, or cut the log short just beyond her, and cut timbers to use as levers to lift the remainder, and prep a stretcher such that the 5 of you could have carried her out in about the same time as it took to get to where you could make a call. But it might have been exactly the wrong thing to do. To put it bluntly, since you had no medical equipment like pain medications or oxygen, and no medical expertise, she might have been DOA as a result, rather than making it to a hospital alive. Life is full of events which don’t turn out the way we want them to. Calling 911, as your hostess did, is supposed to work, and usually does. Sure, if you’d called Ray Brook, the help might have been organized sooner – or not, depending on how long it took the rangers to get there, and whether the locals would take direction from the DEC. There’s much to be frustrated about in the way the “help” unfolded, and much to be sad about in the ultimate result, but it’s not at all clear that faster response would have changed the outcome. What you and your friend did was the right thing, at considerable risk to yourselves. The damage was done when the tree fell, and she made it out alive; you couldn’t have done any more.